Potato is one of the veggie that is liked by most...Every one enjoys eating it..and its a very flexible veggie...You can make it in any form and it never tastes terrible...whatever spices may be used or what ever cooking technique is used.. It is one of the fave veggies of my son too...I try cooking it in many forms and this is one among them..
2. Using a motar and pestle, coarsely crush the coriander seeds. Heat oil in a pan on medium heat. Add the mustard seeds, cumin and crushed coriander seeds. Fry till mustard pops. 3. Add the onion and fry it till golden on low heat.Add turmeric and chili powder and stir to combine. Add salt and pepper to it. 4. 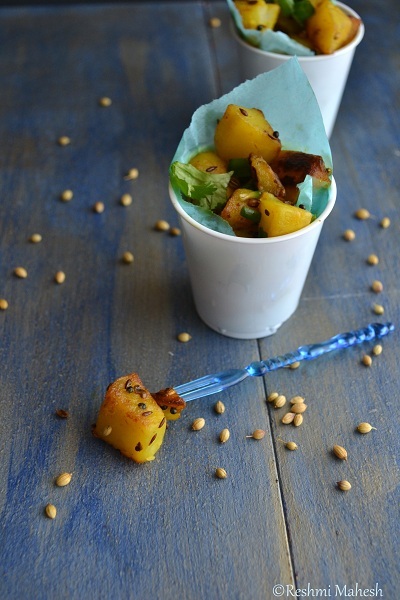 Add the potato cubes and fry for few minutes for flavors to combine. Turn off the heat and add the lemon juice, onion greens and cilantro. Add more salt if needed. 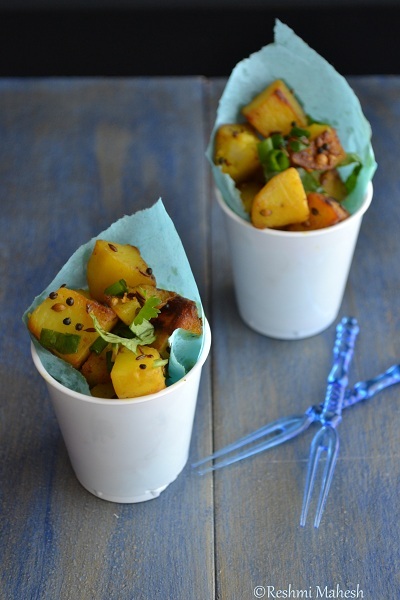 Sprinkle the chili flakes for heat.Serve warm as a tea time chaat or as side for rice or rotis. Labels: Chaat, Dry, Easy Food, Indian, sidedish, snack, Starter. yes love potatoes and the chat looks wonderful. 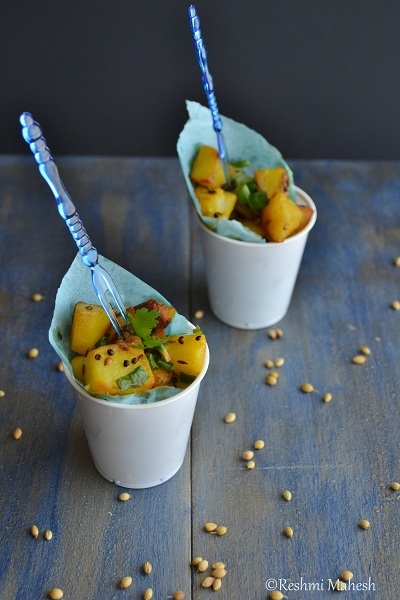 Awesome post Reshmi.I love such cute recipes. Great idea. I always make them and eat them with rice and sambar. nice snaps and a nice color coordination and good presentation. 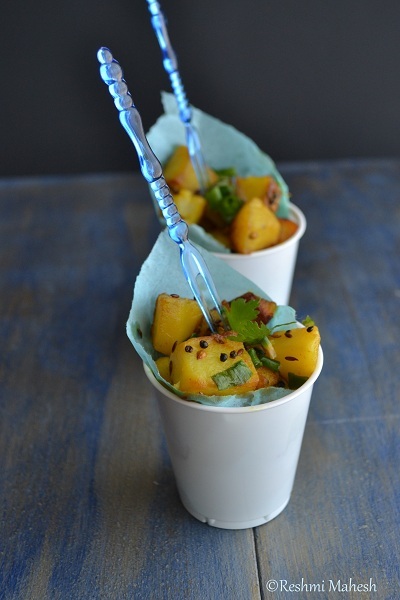 Chaat with potato is very nice idea. Looks delicious. Looks so flavourful and delicious!! 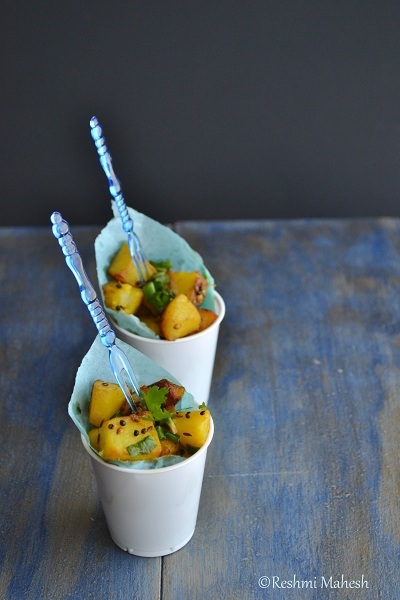 True,potatoes are very versatile..Yummy chat with great tempting clicks!! What a great simple recipe! Those cups look cute. 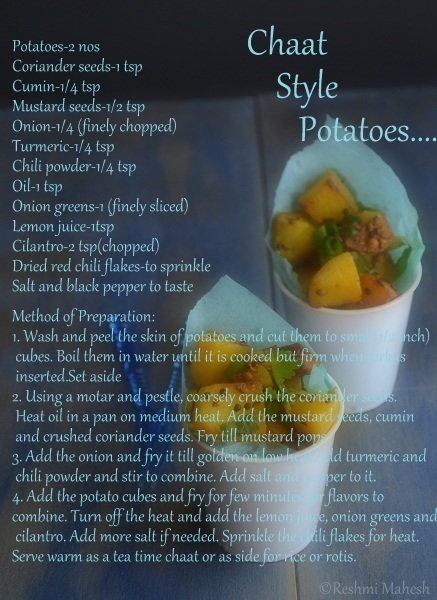 Potato chaat looks yummy. Beautiful click. This looks super inviting & awesome!! 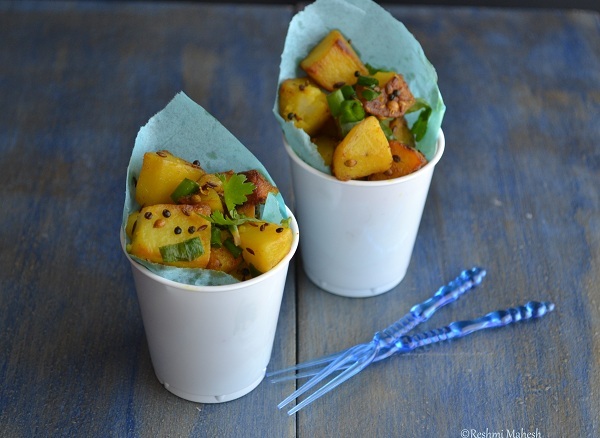 Cant take my eyes from ur clicks, fabulous chaat style potato. wow such cute clicks! loved the way you presented. Beautiful pics with a yummy recipe..